As Little A is still only in daycare I didn’t hold out much hope that his Montessori centre would do anything this year, that is until I found a note in his school bag on Sunday morning informing me that children were being encouraged to dress as their favourite book character that coming week. 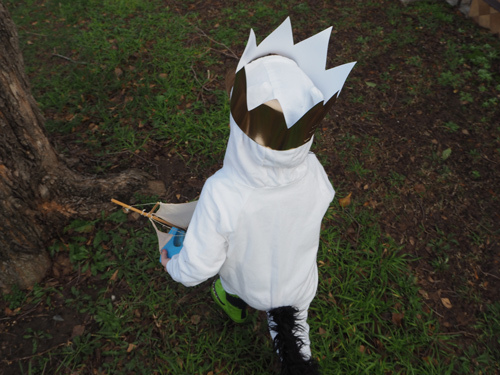 SAH and I debated the possibilities and asked Little A what he would like to go as, we finally decided on Max from Where the Wild Things Are. A favourite book in this house – both SAH and I loved it in our childhood – I have found Little A reading it too himself often (‘Where the wild things are, Oh! there they are!’). So the only issue was making said Max costume. I can sew but don’t have the patience for it so am not a particularly good. None the less I toddled off to Spotlight on Sunday afternoon and found the stars were aligned and found everything I needed. I am not sure about you, but I never find everything I need at Spotlight. I often walk out with only a few pieces required and have to scrape about to finish a project. But not this time, everything from a children’s onesie pattern, to the flannel, ribbing and fake fur. I even stumbled on the perfect material for whiskers. And so it was that I returned home to sew my first ever dress pattern. No mean feat. Little A eagerly assisted and enquired every so often “Where is my costume?” In pieces “Where is my costume?” I am sewing the pieces together “Where is my costume?” Here is the main part of the body, I just have to do the arms. And on it went, until Little A climbed into bed and I stay up well past midnight to finish the darned thing. 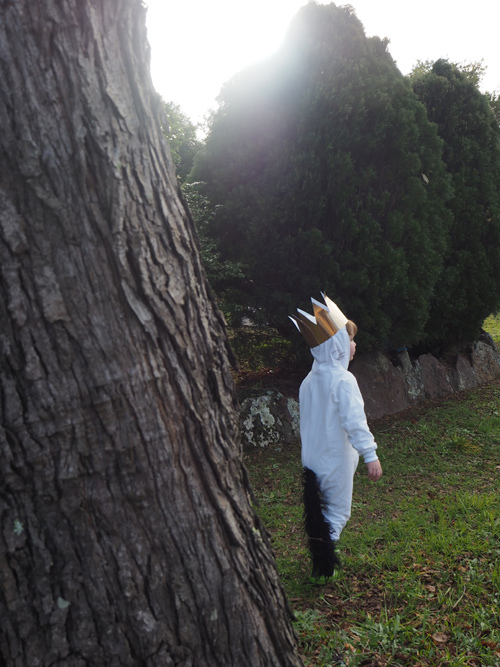 To make Max’s wolf costume I used white flannel material and a Kwik Sew toddler onesie pajama pattern which I customised slightly by leaving off the neckline and zipper tab, instead I traced one of Little A’s hoodie’s to make a hood pattern and attached that to the neck. I hand made ears and sewed them on the hood and cut lengths of thin round leather and hot glued them on for whiskers. I made a tail from black fake fur and attached it to the back of the onesie. 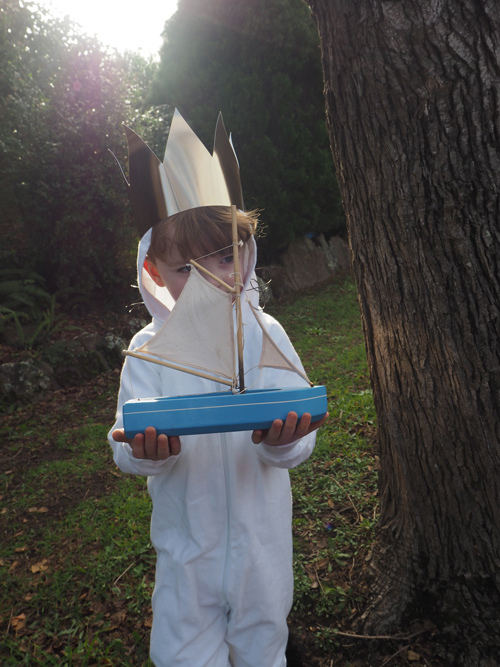 I decided to forego the claws depicted in the book but SAH made a simple crown out of gold foil cardboard, then found Little A’s sailing boat as a stand in for Max’s boat he uses to sail to the where the wild things are. I was so pleased with the final result, having never made clothes from a pattern before (toys yes, clothes no) so the next morning I was SO excited as I zipped Little A in and found it all fit perfectly, only to be heart broken when the wild ways of an almost 3 year old saw him decide he didn’t want to wear it. At. All. Biding my time until later in the week and a break in the rainy weather I suggested to Little A we should go for a walk around the neighbourhood and be wild things together. Agreeing this was a good idea, Little A donned his costume finally and we stomped around the streets, finding sticks, leaves and interesting things to play with. Success! I followed after my wild thing with my loaned Olympus OM-D E-M10 loving the fact it was so small and easy to use, so I could snap away getting great shots while keeping an eye on our surroundings. 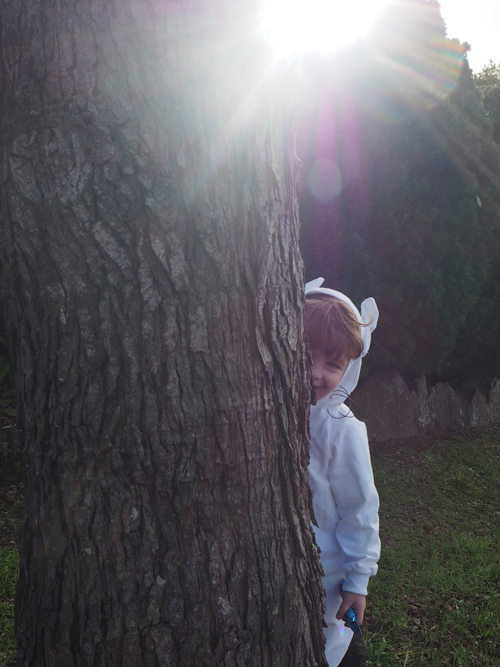 The morning light peaked through the trees and added a storybook feel to the shots. When we returned home I removed the costume and soaked the knees in stain remover to get the grass stains out! Whoops! And while Little A happily played I used the wifi feature on the Olympus to transfer a few photos to my iPad and post them on my Design Cherry Facebook page – being very proud of my handy work, my cute kid and to celebrate book week as a book designer. The following day Little A happily wore his Max costume to daycare and came home still wearing it! A real hit! Now I just have to follow this up next year… oh my god.